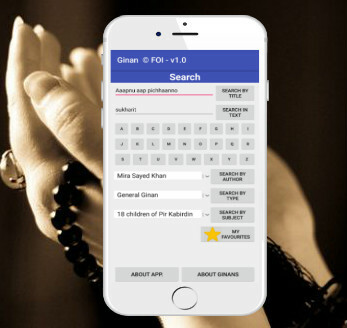 Ginan App - Android application for Ginan audio, text & meanings | Ismaili.NET - Heritage F.I.E.L.D. DOWNLOAD it here - this App is not available in the Google Play Store! Click on the app logo to download the app GinanV1.apk onto your phone. Once downloaded, click on the file to install it. You must accept "from unknown source" just one time. Compatible from Android version 5.0 and up. Permission request : Access to phone (in order to stop the mediaplayer during phonecalls). I feel that unless we are able to continue this wonderful tradition, which is a burden and duty upon the Ismailia Association in particular, to teach the younger spiritual children their Ginans, I feel that we will lose some of our past, and some of our past which is most important to us and must be kept throughout our lives and the lives of the spiritual children who are yet to be born. Many times, I have recommended to My spiritual children that they should remember Ginans, that they should understand the meaning of these Ginans and that they should carry these meanings in their hearts. It is most important that My spiritual children from wherever they may come should through the ages and from generation to generation, hold to this tradition which is so special, so unique and so important to My Jamat. is our holy dua also available on the app. i would love to have that on my phone.